How can I set up a sign-up/booking sheet for my students to sign up to timeslots such as office hours? This article describes the process of creating a sign-up sheet (booking schedule) using the self-enrolment group set functionality, for the purpose of creating one sign-up sheet listing multiple groups from which to choose to join. Once a member joins a group in a set, the member cannot enrol in other groups in that set. 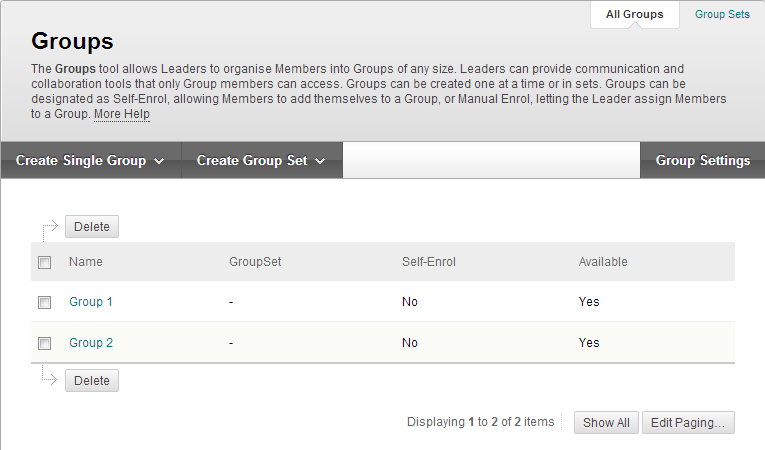 Step 2: On the Groups page, mouse over the Create and then select Group Set, Self-Enrol. Group Available: Choose Yes to allow users to work with the group tool after you sign-up, such as having an online discussion. OR choose the option Sign-up Sheet Only if you just want them to sign-up but not work together online. If you are using the Groups feature, you will also want to choose which tools the students have available to them, but this is not necessary. If you are doing Sign-up Sheet Only then you can ignore these options. Step 5: A group will be set up with the name you have specified above and a number after it (e.g. if you have three groups in your group set called Timeslot, then the names of the groups will be Timeslot 1, Timeslot 2 and Timeslot 3). You will want to change the names of these groups to be the timeslot/option that you want students to pick from. So you might name them something like 'Sept 17, 9-10'. Do this by selecting Edit in the double-chevron menu for that group. Change the name and click Submit. Repeat this for all of the groups you set up as part of this sign-up sheet. 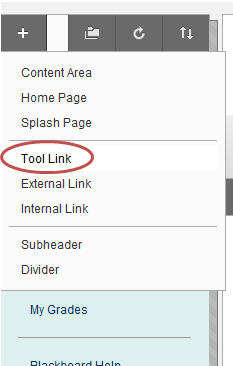 Step 6: Once all of your groups make up, Make sure the Groups tool link is listed on the Site Menu. All of your sign-up spaces are now set up successfully. Below are further instructions showing how to view the groups as a staff member, and what the student perspective of signing up to the groups looks like, but these are not required for set up. For example, on the Groups page, the groups that were created are listed. 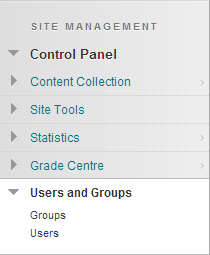 Click on the group name to customise each group individually, add information to the available tools, and so forth. To change a group's name, adjust members (if after students join groups, you need to re-arrange members for whatever reason), and customise tools and settings on a per group basis, click the drop-down arrow and choose Edit. If Group Available=Yes or Group Available=Sign-up Sheet Only, members can access the sign-up sheet from a Groups link you add to the Site Menu. When groups have filled up (if you set a maximum), they will no longer appear on the Sign Up Sheet page. 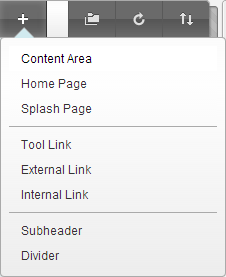 Selecting Group Homepage will always return the member to his or her group's space. If Group Available = Sign-up Sheet Only, the group will not be available to work in. 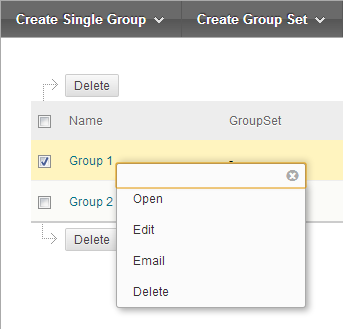 The member will not see the group's space until you edit the group set and choose Group Available = Yes. Once a member joins a group from the Sign Up Sheet page, the member cannot enroll in other groups in that set. That member will no longer have access to the Sign Up Sheet.